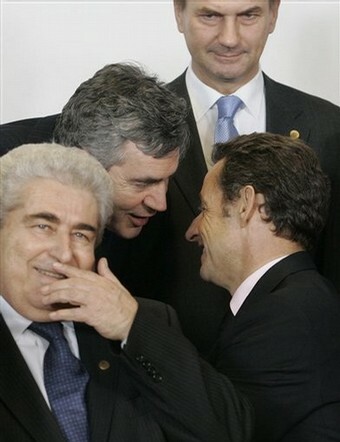 British Chancellor Gordon Brown, center left, shares a word with French President Nicolas Sarkozy, center right, during a group photo at an EU summit in Brussels, Wednesday Oct. 15, 2008. Efforts to calm the impact of the global financial crisis will top the agenda at a two-day EU leaders summit along with talks on how the 27-nation bloc can keep on track ambitious promises to cut greenhouse gas emissions by 20 percent by 2020. Standing rear is Estonian Prime Minister Andrus Ansip, and front left is Cypriot President Dimitris Christofias. PARIS (AP) — The idea is ambitious: World leaders joined by aides to the new U.S. president-elect would gather before the year’s end in New York and attempt to forge a new vision for the global economy. French President Nicolas Sarkozy has teamed up with British Prime Minister Gordon Brown to press for such a summit, and the French leader travels to Camp David this weekend to lobby President Bush to sign on. Brown, buoyed by the praise he won for engineering a British bank bailout that inspired U.S. and European rescues, is proposing “radical changes” to the global capitalist system, including a cross-border mechanism to monitor the world’s 30 biggest financial institutions. Sarkozy has floated the idea of reforming rating agencies and even exploring the future of currency systems. Details remain vague and the obstacles are many. But the political pendulum, at least in Europe, is swinging decisively in the direction of tighter control and supervision, away from the laissez-faire economics that fueled a colossal global boom and appear to have enabled an equally dramatic bust. In Brown’s view, what’s needed is nothing less than a new version of the 1944 Bretton Woods conference that brought together Allied leaders and established a post-World War II global monetary and financial order, laying foundations for the International Monetary Fund and a currency exchange regime that lasted for three decades. Behind the lofty rhetoric, Brown and Sarkozy are backed by a degree of clout. They have proved instrumental in the past two weeks in corralling European governments to dig deep into taxpayers’ pockets to shore up banks, unfreeze credit, and soothe markets. But experts wonder whether leaders at the proposed summit will truly be able to set aside national interests and clashing legal and business cultures to agree on a common vision. In exchange for global financial stability, nations could be forced to sacrifice autonomy and economic growth under tighter regulatory shackles. The gathering aims to bring together the Group of Eight industrial powers as well as emerging players like China and India — and countries at different stages of economic maturity will bring different needs to the table, as climate change talks have made abundantly clear. Officials in the waning Bush administration are also politely dismissing global regulation and some observers are skeptical Europeans can sell the idea to any U.S. president. “I’m very dubious that much can be done,” said Charles Wyplosz, an international economics professor in Switzerland. The White House is playing down the likelihood Bush will agree to a time and place for a summit when he meets this weekend with Sarkozy and European Commission President Jose Manuel Barroso. For Brown, the banking bailouts are only phase 1 in getting finance working again. Phase 2, he argues, will require global action as sweeping as that which gave birth to the United Nations, the World Bank and the IMF in the 1940s. At a European summit this week, Sarkozy and Brown started to flesh out their proposals, backed by Barroso and German Chancellor Angela Merkel. The most eye-catching proposal from Brown — albeit one based on a proposed European system — envisions a cross-border monitoring program for the 30 biggest giants of global finance, such as America’s Citigroup Inc. or Britain’s HSBC PLC. He also called for the 185-nation IMF to be turned into an “early warning system for the world economy,” with international monitoring powers. Such reform would mark a revival for the IMF, which has receded to the sidelines of the global economy in recent years. Sarkozy cast his net even wider. The conservative — who has in recent weeks sounded increasingly like a leftist — wants discussion on tax havens, hedge and sovereign wealth funds, the “folly” of big pay bonuses for risk-taking executives and even how many major currencies the world needs. Some of his harshest words were for ratings agencies, hinting that he wouldn’t be sorry to see them disappear altogether in the financial architecture that he and Brown say they want built. “Do we keep them?” he asked. “What do we replace them with? “Should they only be American?” he added, in a statement bound to get attention from U.S.-based Moody’s and Standard & Poors. As always, Sarkozy is in a hurry. Waiting three months until John McCain or Barack Obama is sworn in runs the risk of the crisis getting worse or getting better, which could frustrate the drive for fundamental reform, the French leader warned. Brown’s talk of “very large and very radical changes” could prove highly problematic in a capitalist system that has grown increasingly complex and intertwined since the end of the Cold War. Experts say experience shows that getting nations to agree on specific rules that could crimp their economic strengths can be a long, frustrating and sometimes fruitless process. And politicians now howling that capitalism needs curing turned a deaf ear to warnings of flaws in the banking system when economic times were good, they point out. Wyplosz predicted that leaders will find, once they get down “to the nitty gritty,” that reforming the World Bank and IMF is going to be difficult. And he was pessimistic about the prospects for effective cross-border policing of banks, saying countries have a habit of wanting to protect their own banking champions from outside meddling. “There will be a lot of talk but the discussions will go nowhere and two or three years from now the urge to change things will be gone,” he said. On closer inspection, Brown’s still ill-defined proposal to better supervise big financial groups may also not live up to the billing of radical reform. A British Treasury spokesman, who could not be identified under government policy, said Brown was referring to creation of committees that would meet regularly to swap information on big banks’ behavior. Each committee would be made up of regulators from an array of countries, likely including Australia, Canada, France, Germany, Hong Kong, Italy, Japan, the Netherlands, Singapore, Switzerland, Britain and the United States, the spokesman said. Some experts are also concerned that a summit with such an ambitious yet vague agenda could distract leaders from far more concrete and pressing steps, not least forcing banks to squirrel away more money so they can better ride out tough times. This entry was posted in Crime & Corruption, Economic Takedown, Financial Scandals, Global Government, Order Out Of Chaos, Social Engineering, Wealth Redistribution. Bookmark the permalink. Giggling girlies of NWO world prison. Oh how they laugh at the dumbed-down citizenry, all the way to the bank.